WWE United Kingdom Championship: Pete Dunne VS Roderick Strong; Dunne wins and retains the WWE UK Championship. TM61 VS John Skyler & Andrew Duckworth; TM61 wins. 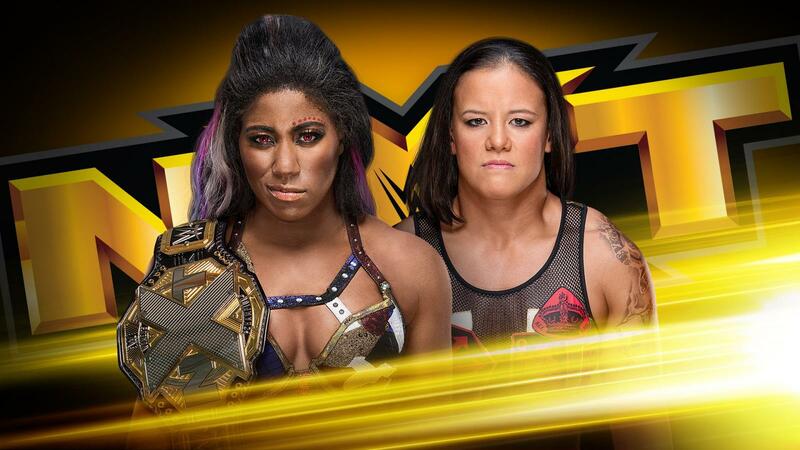 NXT Women’s Championship: Ember Moon VS Shayna Baszler; Shayna wins by disqualification, Ember retains the NXT Women’s Championship. WWE United Kingdom Championship: Pete Dunne VS Roderick Strong! 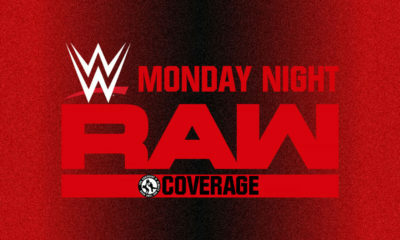 No need to wait, this highly anticipated crossover match starts NXT off! Can the British Bruiserweight hold on to his title when faced with the American Savior of the Backbreaker? The bell rings and they tie up right away! Dunne powers Strong to ropes while the fans duel. Strong and Dunne spin around and end up in a corner, the ref calling for a break. The break is anything but clean, but the two cool off to circle again. Strong keeps Dunne from getting too close to ropes before they tie up again. They end up in another corner but then come right out. Dunne gets the armbar takedown but Strong gets right up to attempt a high stack cover, ONE, but Strong transitions into an attempt at his signature hold. Dunne resists and rolls to flip Strong, but both men are right back up on their feet. The fans applaud this evenly matched match while we go to break. NXT returns to find Dunne in control of Strong. He brings Strong up and goes after the fingers. Dunne brings Strong’s arm down to the mat and bends it back, before kicking it! Strong rolls out of the ring to give himself time but Dunne is right on him. Dunne bends that arm and teh fingers all over again, then brings them to the steel steps. He bends Strong’s arm again, then stomps on it! The Bruiserweight is merciless as he stalks Strong around the corner. He grabs that arm again to bend it from wrist to elbow as he leads Strong all the way to the other steel steps. Dunne wedges Strong’s hand inside the gap between steps and post, then clubs the arm to twist it! The ring count is refreshed before Dunne keeps on Strong with a chop. He puts the arm back on the steps, but Strong pulls it out of the way in time. Strong then pulls Dunne off the steps to throw him into them! Dunne falls to the ground while the referee checks on him. 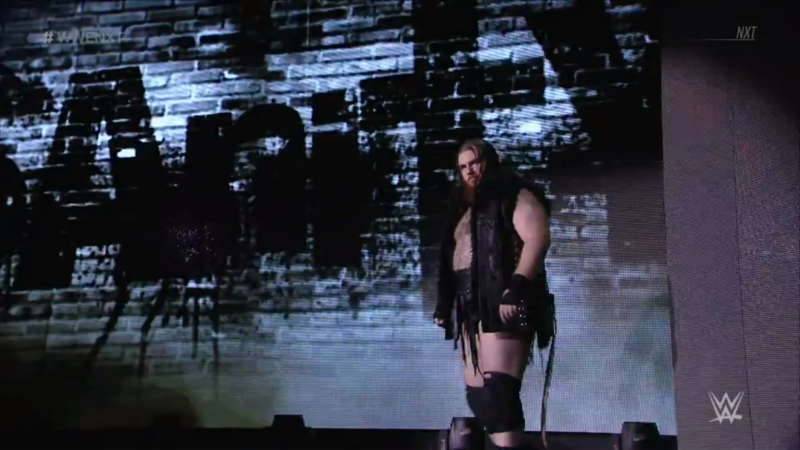 Both men are apparently okay to continue, so Strong brings Dunne into the ring. Cover, TWO, but he clobbers Dunne with low boot after boot. He grinds a knee into Dunne’s ribs, pulling him in add pressure. Dunne uses his legs to fight out, the fans duel as Strong staggers back. Strong returns and grabs Dunne again, for a pumphandle backbreaker! Cover, TWO, but Strong keeps his cool. Dunne clutches his back as Strong brings him up into a corner. Strong chops Dunne, Dunne slaps Strong. Strong boots back and rocks Dunne, then brings him back up for yet another backbreaker. Dunne rolls to a corner but Strong won’t let up. Strong stomps a mudhole into Dunne, even as Dunne tries to fight back with finger manipulation. The fans duel as Strong brings Dunne up and to a corner. Strong hoists Dunne to the top rope then climbs up with him. He goes for a superplex but Dunne gets a hold of the fingers again. Dunne clubs and slaps Strong to the floor, then adjusts to jump and stomp Strong’s arm on the way down! The referee checks on Strong but Strong won’t give up just because of that. He and Dunne get up onto the apron, Dunne runs over but into Strong’s boot! Strong continues with an enziguri, then a fireman’s carry, just to drop him on the apron! The fans applaud the severity of this action while we go to break. 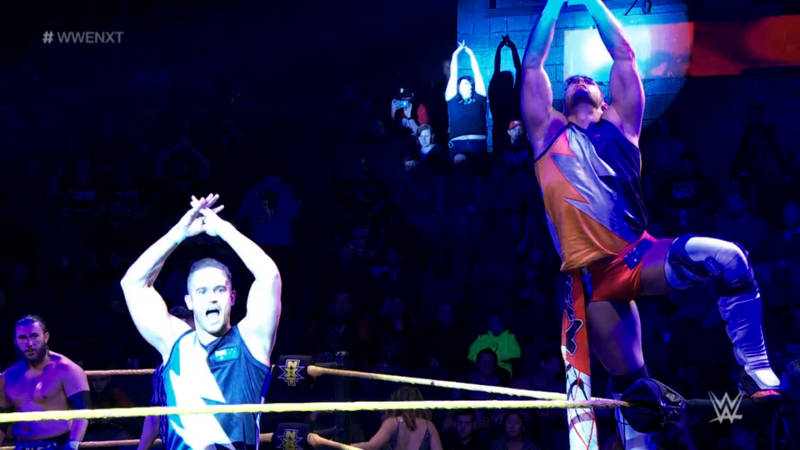 NXT returns again, and Strong stomps away on Dunne. He grabs for Dunne but Dunne scrambles to ropes. The ref counts the break, Strong backs off, and Dunne comes out with a stinging enziguri! Strong is dazed but still hits Dunne with back elbow and forward elbow. Now Dunne is a bit dazed as the fans rally. The two men slowly stand up, and Strong whips Dunne to a corner. Dunne goes up and over to enziguri Strong again, to then Falcon Arrow him into the armbar! Strong rolls so Dunne adjusts into the hammerlock and stretch! Dunne even isolates fingers, before pulling back and letting it fling forward! Strong writhes in pain as Dunne gets himself to a corner. Dunne climbs up but Strong anchors a foot. Dunne fights him off but then Strong yanks him off the top into the cradling hold. However, Strong’s bad arm keeps him from holding Dunne up, so Dunne gets Strong in powerbomb position, for a swift sit-out! TWO! Dunne’s back hurts too much for him to be frustrated. The two men stir with fans cheering them both on. Dunne stands up first as the fans duel again. He toys with Strong, then drags him up by that bad arm. Dunne bends the fingers but Strong powers Dunne into a corner. The buckle impact breaks the hold, and Strong gets space. He runs back in but misses, Dunne throws him back with a German Suplex. 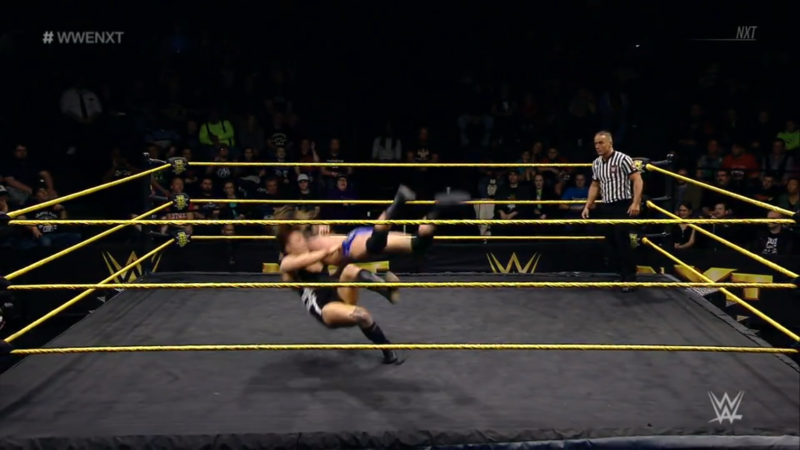 Dunne then hurries out and up, and jumps, only for Strong to dropkick him out of the air! Strong crawls to a cover, TWO! It was a close call, but Dunne still got out. The fans rally for both men again as Strong pursues Dunne. Strong chops Dunne, then runs side to side for the forearm smash! He lifts Dunne but Dunne counters to a pin, TWO and Strong slips Dunne to a crucifix pin, TWO! Dunne jumps but Strong catches him into the cradling backbreaker! Cover, TWO! The fans applaud as both men are down on the mat. The fans build back to a rally, then duel as the two men stand up again. Strong brings Dunne over for forearms and chops, then wants the Olympic Slam, but Dunne slips out to shove Strong into buckles. Dunne gets Strong on the rebound with a Half ‘n’ Half! Dunne raises his fist, but rocks Strong with a swift kick, then covers! TWO! Both men are exhausted but the fans keep rallying for them. Dunne kicks Strong from the mat, then grabs that bad arm for teh triangle! Strong makes it a cover, Dunne fights back, so Strong deadlifts Dunne and brings him to ropes, for an elevated rope guillotine! Dunne slumps down against ropes, but he still gets himself under the bottom rope. The fans duel as Strong and Dunne get up on both sides of the ropes. Strong climbs a corner and brings Dunne over. He brings Dunne up to the top with him, but Dunne resists. Strong clubs Dunne in the back, then hits the SUPER Olympic Slam!! The crash landing sends Dunne far away, Strong has to crawl to the cover, TWO!! Strong feels the frustration building as he and Dunne rest on the mat. The fans rally once more, and Strong goes over to Dunne. Dunne grabs the bad fingers, but Strong breaks the grip to then rock Dunne with a jumping knee strike! He runs at Dunne in a corner for another big knee strike! And then throws him with the running mat slam! Cover, TWO! Strong feels how close he is, but the fans hope they “Fight Forever!” He brings Dunne back up, prepares a suplex but Dunne hits the X-Plex outta nowhere! He’s not done there, he grabs Strong in the pumphandle, but Strong slips out of the Bitter End! Strong forearms, back elbows then throws more elbows from both sides. Dunne catches Strong with a forearm to the back of the head! But this only gives Strong the momentum for a running knee! Strong grabs Dunne in the double underhook, and hits a tigerbomb! TWO, but Strong rolls Dunne for the Strong Hold! However, that bad hand makes it tough to hold it. Dunne manages to roll it back and grabs the bad hand. He snaps the fingers! Strong flies back in pain and tumbles out of the ring! Dunne grins as he gets up and kicks Strong on reentry. Then, Bitter End!! Dunne wins! The UK Championship stays with the UK superstar! What will it take to dethrone the Bruiserweight from his championship throne? Johnny Gargano raised the stakes on himself in regards to the NXT Championship. Even though he went into NXT TakeOver: Philadelphia “the most confident” he’s ever been in his career, he did not defeat El Idolo. However, what he earned that night meant even more to him than a title, “Johnny Freakin’ Wrestling” earned the NXT Universe’s love and respect. But in an attempt to add insult to injury, Andrade “Cien” Almas and Zelina Vega came out to denounce everything Gargano said. Respect? Who cares! The championship is still theirs, and Almas has defeated Gargano in a 3-0 sweep. Gargano isn’t Johnny Wrestling, he’s “Johnny Loser.” Gargano reminded Vega of the hand she played in that match, as well as what Mrs. Wrestling, Candice LeRae, did to her in return. And when Vega started getting in Gargano’s face, Candice appeared! Mr. & Mrs. Wrestling then ran Almas & Vega off, and it pissed Vega off so much that she granted Gargano a rematch, but on one condition: if Gargano loses this time, he LEAVES NXT! Johnny Wrestling accepted the challenge, but will he come to regret it? 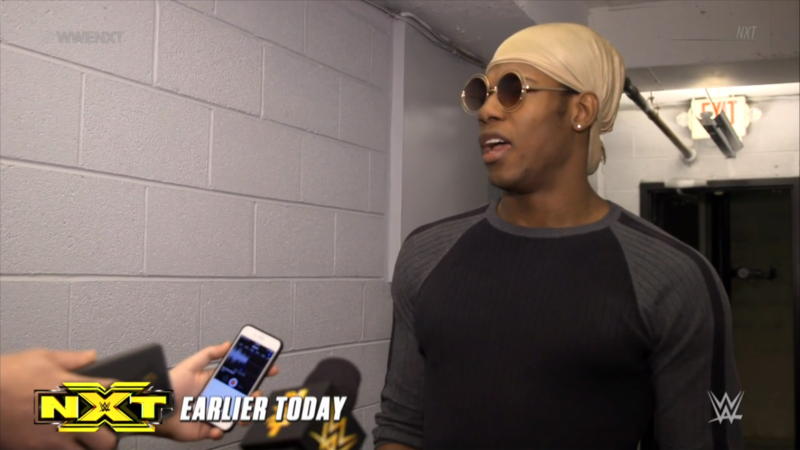 NXT Paparazzi caught up with Velveteen Dream. The Patrick Clark Experience opens by saying he refuses to answer questions regarding Kassius Ohno. Secondly, he addresses his coming match with No Way Jose. “No Way Jose brings the Fiesta, The Dream will bring The Experience. That’s all.” But not really, as he now addresses Tyler Bate of the WWE UK Division. A former UK Champion at only “five foot nothing”, yet Bate sees himself as a big enough star to wrestle Dream 1v1? They ask if he could elaborate. Is he saying he’ll give Bate a match? He refuses to comment, and tells them to get out of the way. The NXT media still has a lot to ask Dream, but that will have to be for another time. 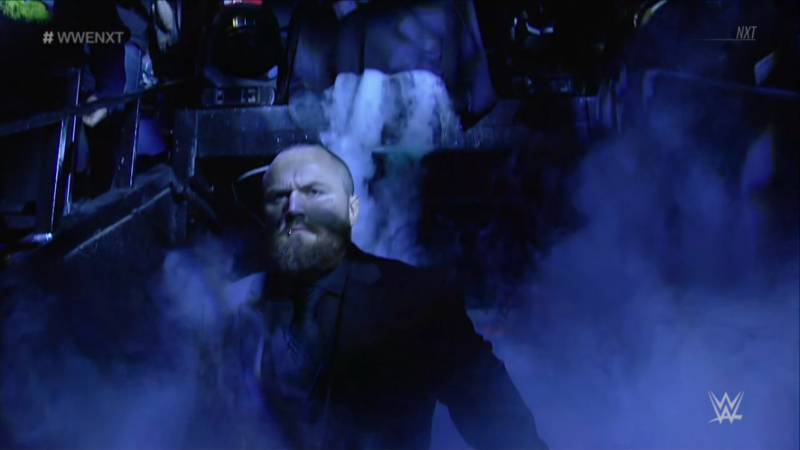 Aleister Black heads to the ring. While the Embodiment of The End is still on a dominant 1v1 streak, he isn’t here to make someone #FadetoBlack. He walks to the ring to an ovation from the fans, and wishes to speak. “This path has always led one way.” It has put Aleister “face to face with a sensation, led to an Experience, and pushed my limits in the face of an Era.” But now Aleister has a “devil” on his back. That devil drives Aleister, because “that devil is the NXT Championship!” Aleister must possess that title. However, a certain Beast of Belfast appears! Equally dominant in his own right, Killian Dain is here to make his presence known. 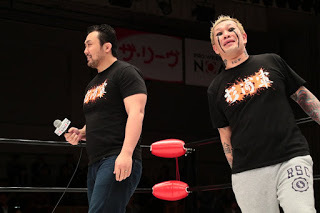 He joins Aleister in the ring to speak his mind. “The devil isn’t on your back. I am!” And Dain will not stop until the NXT Championship is around his waist. 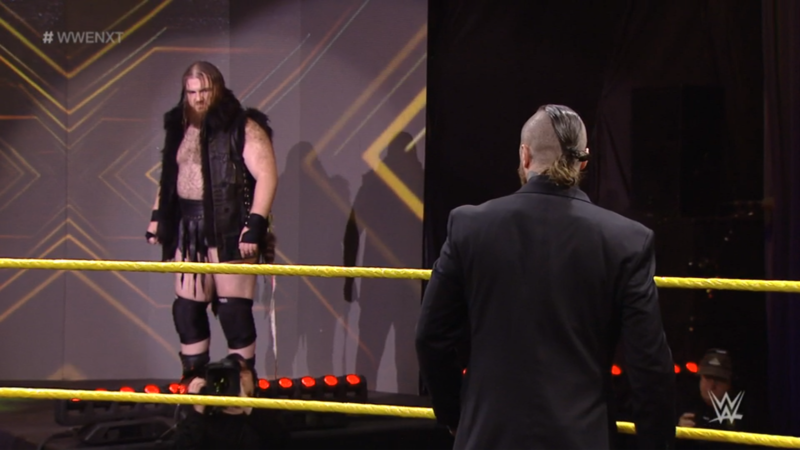 But if Aleister has a problem with what he’s saying, then Dain will warn him: “Your path will be stopped by chaos.” The two stare down, but Aleister is not intimidated. Dain goes to leave when Aleister calls his name. Aleister continues by walking up to Dain, and saying, “You crossed me, so now you must Fade to Black.” Dain grins, liking Aleister’s moxie. Dain leaves all the same, and the two stare down one more time as Dain reaches the stage. What will happen when order and chaos collide on the road to the title? TM61 VS John Skyler & Andrew Duckworth! Shane Thorne & Nick Miller are back to continue proving The Mighty Don’t Kneel. Can they also prove that The Mighty Deserve Championships with another win? The bell rings and Miller starts against “The Southern Savior” Skyler. They tie up, spin around and end up at the ropes. Skyler lets go, only to chop Miller at the ropes. Miller fires off forearms fast, then chops Skyler in return. He whips Skyler and knocks him down with a forearm, then chops him in the Mighty corner before tagging Thorne in. Miller whips Thorne in for a big back elbow, then comes in for a corner clothesline of his own. Then he feeds Skyler to Thorne’s lariat! Duckworth rushes in but gets a back suplex from Thorne. Thorne goes after Skyler with a running European Uppercut, then goes for a suplex, but Skyler blocks and kicks at that repaired leg! Skyler clubs Thorne into his corner, then tags Duckworth in. Duckworth and Skyler mug Thorne in their corner, then Duckworth goes for a back suplex of his own. Thorne slips out, shoves Duckworth, then dropkicks him on the rebound. Tag to Miller, tag to Skyler, but it’s Miller who rallies! He knocks Skyler down, sees Duckworth coming and puts the bigger man into an open corner. Miller suplexes but Skyler slips out and around. Miller throws a back elbow but Skyler ducks it, only to end up in a DDT! Duckworth runs back out, but into Miller’s spinebuster! Miller tags Thorne while Duckworth and Skyler end up in the same corner, Thorne leaps for a big cannonball sandwich! The fans fire up as The Mighty pick Skyler up, and hit him with Thunder Valley! TM61 wins! 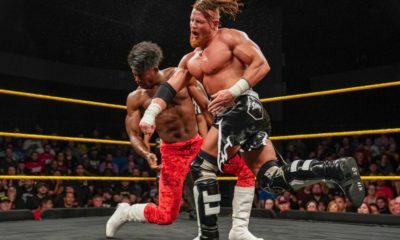 Miller & Thorne are on a roll, can they roll right up to the Undisputed Era’s NXT Tag Team Championships? The Prophecy of Flame may be the #Shenom, but she was still tested like no other against the Queen of Spades. However, Shayna’s claims that Ember only survived rather than won got under the champion’s skin, so this rematch was granted to put the rumors to rest! Can NXT’s War Goddess remain on top against the merciless Submission Magician? 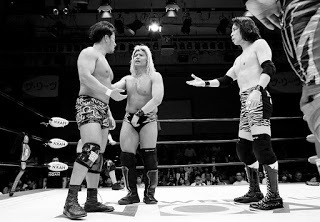 It should be noted that Ember still has Kinesio Tape on her left arm. She may be medically cleared, but is that tape going to be nothing more than a bullseye for her opponent? The bell rings and Ember dropkicks Shayna in the face immediately! She keeps going, hammering away on the “bully” Baszler. Shayna takes it and goes after the bad arm! Ember slips away, kicking Shayna on the mat. Ember throws more hammer fists and Shayna grabs at the bad arm for a Kimura, but Ember still narrowly escapes. Shayna sits up, and Ember kicks her square in the shoulder! The rage does not subside, Ember keeps hammering away on Shayna. She brings Shayna up just to knee her back down, then stalks Shayna to ropes. The fans cheer as Ember kicks and clubs away at Shayna, but the referee counts. He backs Ember down, but Ember still rocks Shayna with an enziguri! Ember roars as fans fire up, and boots Shayna right in the chest! Shayna is uncharacteristically on the defense and down on the mat as Ember goes to a corner. Ember climbs, and we know what that means. She takes aim, but Shayna sees her rising, so she slips out of the ring. Ember watches Shayna catching her breath on the outside, so she hops down to build speed and DIVE! Both women crash into the announce desk, and that unfortunately aggravates Ember’s bad arm! She writhes and screams in pain while the fans chant “NXT! 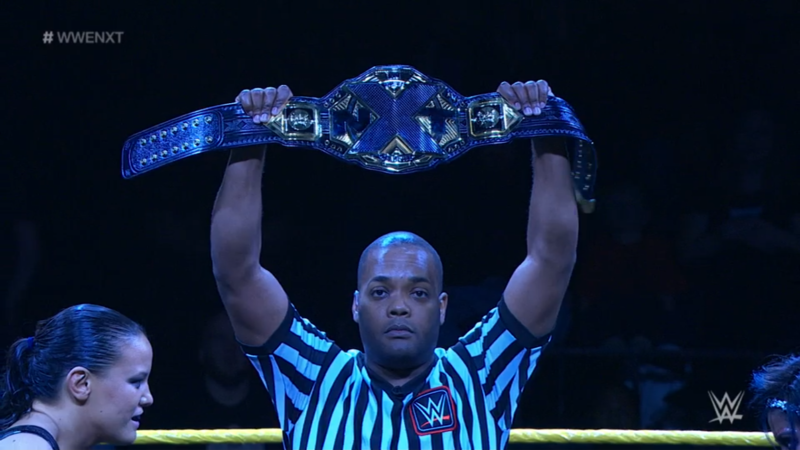 NXT!” The referee also checks on Shayna, and she is still okay to compete. A ring count begins and gets past 7 before Shayna gets up and over to Ember. The count gets to 8 as Shayna puts Ember back in the ring, and this match continues. Shayna goes after that bad arm with a kick, then lets her hair down as her frustration boils up. She tortures Ember with a seated double wristlock. Ember endures and refuses to quit, so Shayna bends that arm back and stomps on it! She isn’t done, she grabs Ember’s arm and goes for the cross armbreaker, but Ember quickly clasps her hands. The fans cheer Ember on, and Ember rolls Shayna like back in TakeOver: Philadelphia! TWO, and Shayna grins, telling Ember it won’t end like that again. She kicks that bad arm, then tries the cross armbreaker again. Ember again clasps her hands to hold it off, but can’t hold on, Shayna gets the full extension! Shayna even adds on a wristlock twist! Ember endures and drags herself around with her legs, and manages the ropebreak by a toe! The ref counts, Shayna lets go at 3, but then comes right back. Ember holds onto the rope but Shayna pries her away to then drag her by her hair. Ember surprises Shayna with a victory roll! TWO! Shayna gives Ember a knee, then throws her into a post! Ember tumbles all the way out and to the ground. Shayna walks around and catches her breath while the ring count begins. Champion’s Advantage prompts her to fetch Ember, but not without adding on a little extra. She exposes the barriers and threads Ember’s bad arm through the gaps, to then stomp away without resistance! Shayna then shifts to pulling on Ember’s arm with the barrier between them! The referee comes out to count, Shayna lets go to keep from being disqaulified. Ember gets free of the guard rail, but Shayna grabs her arm again, torturing it with how she bends it. But then, coming in from the crowd, it’s the Pirate Princess, Kairi Sane! She climbs up the steel steps and jumps at Shayna for a flying forearm! Kairi gets payback on Shayna for her sneak attack weeks ago, both physically and in that the match is disqualified! Ember will retain her championship! Kairi keeps going as she hammers more forearms into Shayna, then pursues her into the ring. Shayna swings on Kairi but Kairi evades to rally on the Queen of Spades! Every time Shayna gets up, Kairi knocks her down. She knocks Shayna out of the ring, but dares her to come back for more. However, Kairi makes the mistake of checking on Ember, and Shayna slips back into the ring! Shayna rushes Kairi but she’s ready for it, and hits Shayna with the Interceptor Spear!! The fans are thunderous for the Mae Young Classic winner, and she’s still fired up to fight Shayna. Shayna isn’t as eager, she backs down. Shayna wins the match but we know Ember retains, will the controversy only delay the inevitable? And as Kairi stares down her MYC opponent, will Shayna have to get through her to try again? 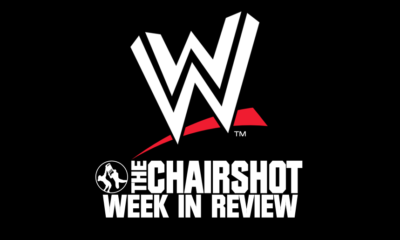 A pretty great episode of NXT here. I was surprised but not at all disappointed with having the WWE UK Championship match first. This was an amazing match, Strong looked strong and it really bolsters Dunne’s own strength for him to win. 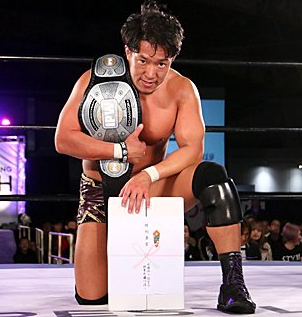 Of course, it was a bit of a foregone conclusion that an American wrestler wasn’t going to win the UK Championship just yet, but maybe even for just a second it felt like Strong could’ve done it. 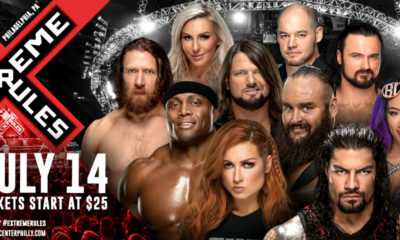 There’s still a lot WWE needs to do to show their commitment to the UK title and its Division, but as long as we’re getting great matches while we wait, I can be patient. 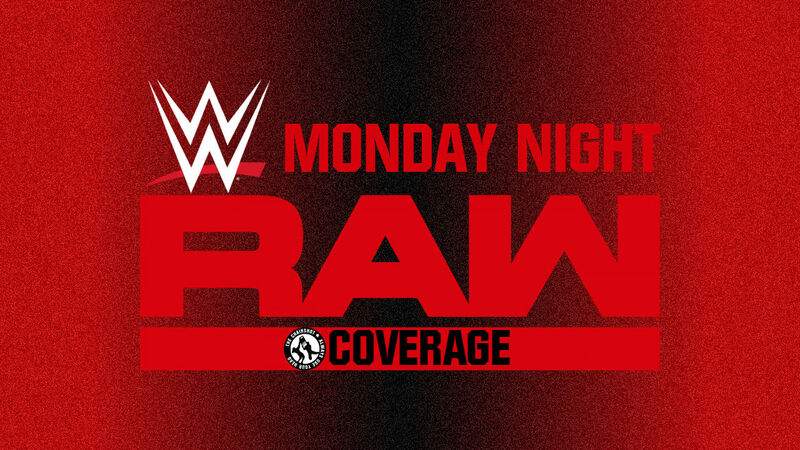 The crossover work helps, such as how Velveteen Dream is taking issue with Tyler Bate. I don’t doubt Dream VS Bate will make for a great program and match, I’m just not sure where it’ll lead either man afterward. However, Aleister VS Damo definitely will lead to an NXT Championship down the way. I can’t see Aleister losing in singles competition just yet, but their match result may depend on next week’s Almas VS Gargano NXT Championship match. There are a lot of variables and moving pieces with the NXT Championship, I’ll likely be pleased by any of the outcomes. When I saw TM61 coming out for their match, I was a bit concerned about the timing, considering we still had the NXT Women’s Championship match to go. In the end, it was a fast match, putting the returning Skyler and the debuting Duckworth away easily. With the Authors of Pain still in NXT but feeling on their way out to the main roster, TM61 should be the ones to challenge reDRagon next. Then in the NXT Women’s Championship, it was shorter and ends in “controversy”, but it was still solid work from everyone. Ember and Shayna play their characters perfectly, the angry “underdog” champion giving the arrogant upstart challenge a small taste of her own medicine, only for Shayna to get the better of Ember. I almost thought we were getting a referee stoppage to give Shayna the belt, a la Kevin Owens pummeling Sami Zayn until he couldn’t fight. Instead, Kairi Sane makes the save! Kairi and Shayna have unfinished business, but they both want to be champion, so I would hope that while Ember is grateful for the save, she and Kairi keep a competitive tension between them. In fact, I would love if it somehow becomes an NXT Women’s Championship Triple Threat for TakeOver: New Orleans to really make Wrestlemania Weekend something to watch.